Recreating a movie cinema experience at home is entirely in reach, thanks to continued improvements in entertainment technology. Investing in a projector for your laptop or desktop computer can be a wonderful way to create a beautiful home theater. As projector costs go down, creating a home theater is becoming more accessible. You don’t have to invest in a gigantic flat screen to enjoy a high-quality “screen.” With the right choice in equipment, you can recreate a theater experience without dealing with long lines and expensive popcorn. There are four essential elements in creating your home theater from scratch, and there is an option for every price range. Choose technology for your home theater based on the specifics of your room, so keep in mind that “more expensive” is not always the best option. The combination of these elements helps to create the enclosed, immersive ambiance of a real cinema. Whether you want to use your home theater to watch DVDs, or to stream free tv online from Crackle, your first step is to invest in these items to enhance your viewing experience. 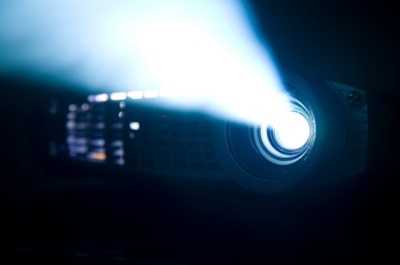 Just like at a real movie theater, the projector is the heart of your experience. While it pays to invest in a decent quality, high-definition projector, it is not necessary to break the bank to do so. You can get extremely bright HD projectors with long lamp lives for under $600. The specifications of a standard home projector should include a resolution of between 720 and 1080 pixels. Ideally, your projector will project directly onto a wall or screen of between 80 and 120 inches. When shopping for a projector, take time and compare as prices can vary greatly even for the same hardware. Another consideration is to investigate the average lamp life for your potential projector as well as the lamp replacement cost. Some replacement lamps are more expensive than others, and you will need to replace them every six months. While it’s tempting to use a blank white wall to project your movies — a technique that works fairly well — there are some drawbacks. Walls usually have a slightly textured surface and can skew a projected image, reducing the image quality. Luckily, picking a screen is simpler than picking a projector. There are two main choices for home theater screens: a fixed frame screen or a pull-down screen. The fixed-frame screen will constantly be on display wherever you install it and the pull-down screen will retract into its hub on the wall. Both are solid options. It is important that the screen you choose is, at minimum, a 90-inch screen. Many people opt for screens that are 100 inches or larger, thanks to the viewing immersion they create. Aside from a screen’s spaciousness, another important feature is its smoothness. Cutting-edge screens offer something called “enhanced contrast,” a smooth finish that can brighten and sharpen the images projected upon it. 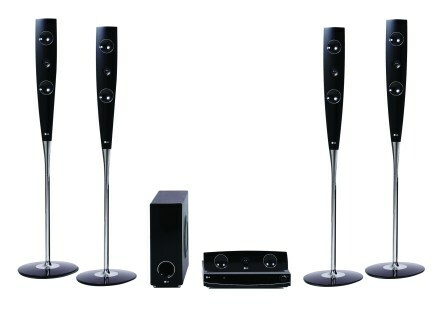 The speakers you choose for your home theater set-up can essentially make or break your experience. There’s nothing worse than watching a movie with low-quality sound. Creating a genuine surround-sound home experience can be extremely costly and technically difficult. This is because the main speakers you’ll be using will not be directly next to the image as they are in a TV setup. The speakers are most likely going to be across the room, requiring you to run a wire from the projector to your speakers. This can get complicated due to the nature of running wires across a room, especially if you use more than one speaker for a surround-sound effect. Invest in a wireless audio transmitter so you can place two or more speakers anywhere you wish without have to run cumbersome cables. None of the above hardware will do you any good without having something to play or stream movies or TV from. For the best screen resolution, consider a Blu-ray player, which provides the highest-quality screen image. To project entertainment, you can also use a basic DVD player, a laptop, a TV or a tablet computer. You’ll want your home theater space to be comfortable, dark and inviting. You can create the ideal atmosphere by mounting the projector at just the right height on the wall opposite the screen. Experiment with this to make sure you install it correctly. You can also use a ceiling mount for your projector. This adds ambiance to your home theater because it recreates the visual dimension of a true cinematic experience. Another simple way to add ambiance is to channel the aromas and tastes of going to the movies. You’d be surprised at how the presence of a hot, fresh bag of popcorn can help. About the Author: Sandra Winterhoff is a technology and entertainment blogger whose writing has also appeared in several national magazines. I’ve been patiently waiting for the prices to decline for projectors but it seems the good ones are still pretty expensive. Sound is also important for me when watching a movie, and I’m happy with a 42″ screen and some good surround sound, which isn’t that expensive to get.